Biological capacity for music has been said to have evolved early on. We are musical by nature, however we need to nurture what we are born with to reach full potential and grow. For wild animals music is used for courtship, territorial claims, and uniting social groups, but us humans have a much deeper meaning for music. To us, music is a sophisticated cultural expression of emotions that does not require words. Some traits can be passed down through generations such as pitch, but most of our ability comes from years of practice. The type of music we enjoy is also affected by our surroundings and how we are raised. On our trip to Argentina, we met Miguel Cordoba, an Argentinian Tango Artist. He was able to share with us information about Tango music and its origin. Watch the interview to find out more! How man made music is a simple concept: in striking a piece of wood against the ground, in clapping his hands together, in beating to clubs together, man found that he was able to create sounds. The real achievement, however, is how man thought up music: the mischievous, beautiful melodies that have shaped our lives since the beginning. Inventors of the first buildings, printers, paintings, they all had something visible to copy: the arching caves, the signs of the desired word, the images of plants and animals all around. To fabricate music, man had nothing visible to replicate. Exactly when the first songs were created is unknown. However, we can speculate that rhythm may have first appeared when man cried of joy over a tribal conquest or defeat of their prey. Songs may have appeared when a mother crooned a little tune to her baby and gradually, after time, it transformed into a soft lullaby with words. An important aspect of music today is its difference from noise. The early tribesmen were able to create this difference when they would beat a signal on a tree-stump, signaling to the people with different rhythms that there was work to be done. Just like we use different tunes today to differentiate one task from another, the early tribesmen would create a code with their beats: changing the tempo and dynamic of their so-called instruments. The first Indian tunes are one of the only examples of songs that we have of primitive man. They consist of old tribal songs that were passed down through the generations, maintaining their same melodies and rhythms but at the same time adapting to the changes of the life of man. MacDowell's From an Indian Lodge, tells the story of an old Indian mother who is devastated by the loss of her son. Adding to this ancient song depressing, slow-moving chords, MacDowell truly captures the feeling of this mourning mother. Moreover, it expresses the tragedy of the disappearance of the Indian race. The Cherokee Morning Song depicts a later time in history for Indian music. During the 1830s Trail of Tears, the Native Americans living in nations in southeastern parts of the United states were forced to relocate in an act of genocide. The removal included many members of the Cherokee nations, among others in the United States, from their homelands to Indian Territory, causing the death of many. Although this song was composed as a response to the unfair and fatal movement, the rhythm and words, "A we n' de Yauh ho" (I am of the Great Spirit), stem from the original chants and songs of the ancient Indians. Just as we do today, an important cultural custom of the early people was to gather around their campfires and tell stories. These stories, usually fictional tales about long, heroic odysseys, would be told as poems, or lays. The storytellers, or bards, made a living by telling their tales: the more interesting the story, the better food, lodging, and gifts the bards received. These poems soon became songs accompanied by a small hand-harp. Homer, the author of The Odyssey and The Illiad, was a blind bard, known for his stories of long, dangerous journeys. Although it is still unknown whether or not Homer was an actual person, his tales carried on through the generations and were eventually compiled into books, showing the importance of the first bards who shaped the music and literature that we study and admire today. The bards were not only an important part of music and literature during the early ages, but their constant traveling allowed them to easily spread information throughout different tiny, isolated communities. Our Music Today: Is it the same or different? The complicated and diverse life that we experience today is depicted in our equally complicated and diverse songs, which have far greater variety than those of the simpler, ancient men did. In our present-day songs, musicians strive to compliment all different tones and to appeal to all different listeners. The feelings expressed in our songs today are that of finer and deeper thought than of primitive man. But without the original rhythm that the first man provided us with when he struck a piece of wood against the ground to get the attention of a female, or when he clasped his hands together at an accomplishment, we would not have the basics to one of the fundamental parts of life: MUSIC. Bangers, or percussion instruments, are probably the oldest instruments because of their easy manufacture. Helping primitive man to express his feelings just as drums do today, these first Bangers were hollow logs that were beat with clubs, rattles full of pebbles, and the clapping together of wood pieces. Soon, man discovered that by using a variation of materials - stretched skin, metals, wood sticks - he was able to create unique sounds. And thus, the drum was invented. In the early times, drums were used for giving signals, either when someone was in danger or when a miracle had occurred. Carrying a drum during war frightened the enemy and was helpful as a way to signal his own men. In order for this to be possible, a portable drum had to be created through a series of trial and error to find the most efficient form of a portable drum. Most importantly, drums in the ancient times were used during the tribal dances, just like they are used today for celebrations of any sort. Many tribes performed sacred dances to their gods asking for forgiveness for their sins or compensation for their good deeds. 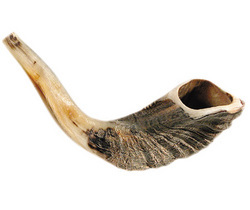 In the early days, bowls and cups from which to drink didn't exist, and man used animal horns. Although we don't have records as to how exactly man figured out that these animal horns could produce music, we can make assumptions as to how this magnificent discovery was made. Perhaps one day the tip of a tribesman's drinking horn broke, and when examining the damages to this prized possession, the horn was placed to man's lips and he blew into it, producing an extraordinary sound that was sent echoing throughout the town. Soon, these simple ram's horns became more intricate instruments like the horns we use today. But before that could happen, man needed to learn the basics of the way a horn works. Man was able to figure out that the larger and longer horns produce clearer, louder tones than shorter ones, making them useful as a signal horn. Using different types of woods and metals, very long horns were created. It was found that mouthpieces of different shapes added distinct tones to the horns. As the horn evolved, various different types were created: the trumpet, the french horn, the trombone, among many others. When listening to the majestic sounds of an orchestra, the string instruments tend to overpower the fewer wind instruments, creating an impacting, vibrating tone. The bowstring, however, wasn't always used as an instrument. Just as the horn was previously used as a drinking cup, bowstrings were predominantly used, and are still used today, as a hunter's equipment or for a leisure sport. The first hunters carried their 'bow and arrow' everywhere with them, assuring protection from any type of enemy. Knowing that this bow was necessary for survival, the hunters of the early times would strive to acquire the most effective string and bow combination. These people knew that the best bows would make a humming noise as the arrow was sent flying; a beautiful sound to the hunters' ears. Thus, as the hunters went out to find the perfect string to attach to their bow, they found that when plucking different sized strings, distinct humming sounds were created. Soon, man used his knowledge about strings from bows to make new string instruments that were useful to the community during festivals, offerings, and loneliness. Discovering how one string could make different pitches, harmonies, and dynamics was essential in transforming a simple string to the magical, complex violin. Two different kinds of stringed instruments were soon developed: the picker and the scraper. The harp was the first picker, perhaps the result of a broken bow. When the hunter placed a longer string behind the shorter string on his bow, the harp was created. The scrapers were those instruments, like the viola, violin, cello, and base, that can also be played using a bow. A scale is an invisible ladder that is essential to making different tones in music. Each different step, or note, in this ladder is a certain distance higher than the one preceding it, creating an immense variation of ascending or descending tones from which one can create music. Every piece of music is made from one set of tones, or scale. However, there isn't only one scale, there are different kinds depending on how many tones there are in the scale. For example, the do-re-mi-fa-so-la-ti scale has seven tones which are each equidistant away from each other, no matter where the pitch of the first do starts. The first scales consisted of five tones, but there are scales with as many as 20 or 24 tones. Today, the twelve most common major scales contain eight tones, or one octave. However, these eight tones can be added together in groups of octaves to play scales of one or more octaves. Why Don't We Have Ancient Music? When man first learned to play the horn and how to make music, he would create the same tone, the only one he knew how to play. Therefore, when creating the harp, man would tune the string on the harp according to that same tone that had been used all along. Finally, when man established the differences between tones, scales were created to name the sounds used in music. However, the problem was making signs to record what was being played or sung. Ancient peoples left multiple signs and writings about music and the instruments they created, however they never wrote down the actual scales they used or the melodies they sang. The most upsetting part about the lack of written music of many ancient peoples is that we can't truly feel the emotions of those people. We'll never know exactly what tunes the young Egyptian boys played with their flute cut from the reeds of the river. Or the quiet, soothing melody that the lullaby that Pharaoh's daughter sung to baby Moses is comprised of. The slaves of Egypt must have had songs that they sang to pass-by the hours that they spent carrying large stones to create the large pyramids. Moreover, how did the melodies that were sung and played then reflect their daily lives? The Greeks wrote their singing music down by using letters of the Greek alphabet. They wrote their instrument music down by using other signs to represent the tones sounded by the instruments. Similarly today, we use the letters of the alphabet to name our notes, but not as our written music. The reason being that it is almost impossible to be certain how a tune written in alphabet letters is supposed to sound. For hundreds of years, the Romans, in the time of the birth of Christ, tried to solve the seemingly impractical task of writing down melodies that were invisible and constantly moving. There were many essential details that had to be present in the written music in order for the player to be able to interpret it just as the composer wanted it to be. The tones had to be represented, the relation of tones in the same melody had to be shown, the pitch had to be depicted, and it the tune had to be written in a way that made it clear to everybody what had to be played. During the Dark Ages, the church schools, or monasteries, ran the education and social systems of the Roman Empire. At points throughout the day, the working would be set aside and everyone would go into the church for services. There, there were songs performed by a choir of men and boys who also chanted prayers. Music was an important aspect of life during this difficult and confusing time, acting as a recreational activity for the monks. Still by the 600s AD, there was no written music and Pope Gregory I established a school in Rome where the cantors, or singing teachers, would be taught. Since there was still no way to write down music, the monks had to memorize the songs that they were taught. "Music is the most worthy, courteous, pleasant, joyous, and lovely of all knowledge; it makes a man gentlemanly in his demeanor;...music encourages us to bear the heaviest afflictions, administers consolation in every difficulty, refreshes the broken spirit, removes headache, and cures crossness and melancholy." -The Venerable Bede, Monk: 673-735 AD. "Bless the Broken Road" by Rascal Flatts is a song that talks about predestination. This excerpt in particular talks about how the man (or Flats depending on how you look at it) believes that all of his mistakes were all planned to take place, leading him to the woman he loves. "Every long lost dream, led me to where you are. Others who broke my heart, they were like northern stars. This song "Family" from the movie modeled after the Broadway show Dreamgirls starring many welknown celebrities including Beyonce Knowles, Jamie Foxx, Jennifer Hudson, Eddie Murphy, discusses how important it is to be unified as one big family no matter who you are or what you look like. Here specifically, the singer is talking about their music group but there really is a greater meaning behind the words. The music group, given the setting, is forced to deal with the issues of segregation and its negative effects on their singing career. One part of this song that strikes me as inspiring is "This dream is for all of us. This one can be real, and you can't stop us now, because of how you feel." I find this excerpt to be very inspiring. I thought of this dream thats being referred to as the American dream that everyone, including those who immigrated wished to be a part of. No one should have the right to stop anyone from achieving this dream that we all share just because of their personal opinion. "Patience", another song sung by the cast of Dreamgirls is a song that directly addresses the struggles that African Americans had to face during segregation. The lyric, "Tell me when will come the morning of a brighter day!" shows the discontent that existed amongst African Americans and the frustration that they felt when they were stripped of their rights. The fact that this song focuses on patience and waiting for the world to change is a very admirable approach to the situation. Often times you walk down the street and see numerous riots going on about numerous subjects where people feel they are being exploited or poorly represented. The fact that this movie goes against violence and stresses patience shows not only its recognition that ways need to change but also that you can't use violence to get what you want. This song "The Scientist" by Coldplay represents the struggle that immigrants felt when leaving their country of origin and moving to the United States. Many were told that moving to America would be the answer that solves all their problems they were dealing with in their home country. Despite what they were told, many found this move was much easier said than done when the time came. The song also talks about being forced to leave your loved ones when leaving is the only option. This song sung Willow Smith shows how we've developed from our more conservative past into being known as more rebellious and individual teenagers. Willow, representing teenage girls in particular, would never in a million years be able to produce such a song as this in years passed. We come from a time where women wore only long skirts with intricate patterns making sure barely any to no skin was exposed, much different than what we get from this video. Willow describes how she's "a type girl that likes to rock the beat". By this she means that she likes to do things differently, live on the wild side, and try new things to establish her individuality which is again a concept that is relatively new in terms of women. The video itself, being the construction of a city from basically nothingness, shows the progress we have made within the more recent years as well. Ms. Ho, the symphonic band teacher at the Wheatley High School, talks about the origin of western music and how it has evolved through the years.